If you are interested in having a glass wine cellar installed in your home or business space, there are a few things to consider. Glass wine rooms can be an excellent addition to any space if done properly. Storing and preserving wine is a science and takes more care than most people think. Cellaring wine requires the perfect combination of light, temperature, and moisture in the air. Finding this balance can be difficult when installing a glass wine cellar, so it’s a good idea to leave it to the professionals! Nvision Glass has extensive knowledge and experience with installing glass wine rooms. Contact us today! Choosing the right location for a glass wine room is one of the most important considerations. If the cellar is in direct sunlight, the wine can get too hot and lose its flavor. 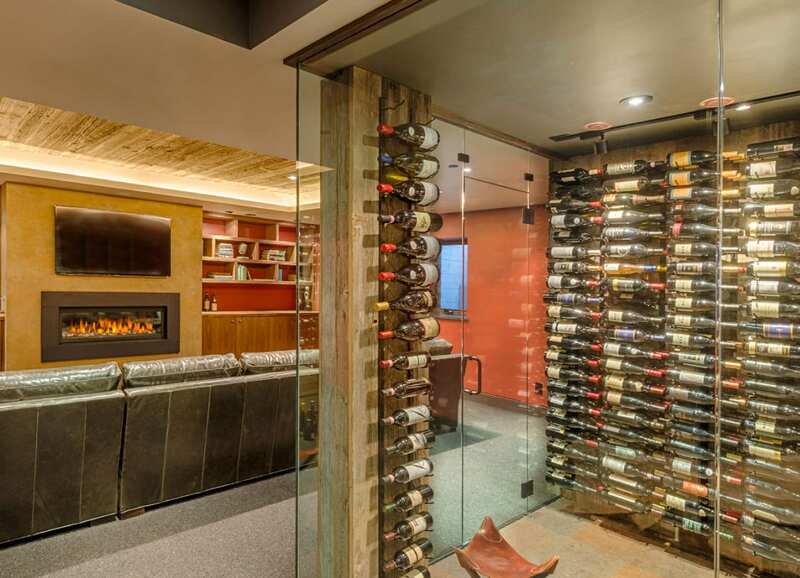 The ideal place to build a glass wine cellar is in the coolest section of a home. The farther the cellar can be from direct sunlight and heat, the better. If your home has a basement, this would be the best place to install the wine cellar. However, if you don’t have a basement, any place out of direct sunlight will work with a cooling unit. When building a glass wine room, it is recommended to choose a room that has thick walls and insulation. Selecting the type of glass to use is also a major consideration because it plays a part in both the look and functionality of the cellar. The decision between single pane and double pane glass should be easy. Double pane glass is much more durable and significantly increases the R-value, resulting in more efficient cooling and less susceptibility to moisture condensation. In addition, the glass should also be tempered to increase strength and UV coated to decrease the effect of ultraviolet radiation on the wine. When wine is not stored in the proper environment, it can lose its natural flavor. The ideal temperature of a glass wine room is between 55 and 58 degrees Fahrenheit. If the cellar is too warm, oxidation can occur and the wine will age faster. When wine ages too fast, it generally loses both its body and flavor. If the wine becomes too cold, it will become numb and also lose its flavor. Humidity is also an important consideration when installing a glass wine cellar. When there is too much humidity or not enough, there is a risk that the wine can spoil or the cork can break. The recommended humidity level for a wine cellar is between 55 and 75 percent. Investing in a humidifier will ensure that your wine is stored in the ideal environment. Although lighting isn’t a great consideration in building a glass wine cellar, there is one simple rule: UV lighting should never be used. UV lights will damage your wine over time, so it is better to stay away from this kind of lighting. A few good options include IC lights, thermally infused lights, or recessed lighting. Each of these offer light that is bright enough to identify bottles, yet dim enough to not affect the wine aging process.